Predators are a huge concern for chickens, especially those raised in backyard coops that aren’t as secure as they should be. 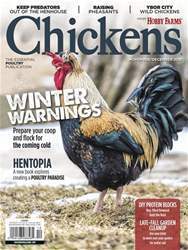 Whether you raise two backyard chickens or thousands in a commercial setting, take precautions to mitigate the birds’ exposure to predators. It’s far easier to deter predators before you have a problem than to keep predators away from a known food source. Your coop design and management sets the foundation for safe chickens. Your goal is to make your chickens — and eggs, if you have layers — as difficult to get as possible. FENCING Your coop needs a sturdy fence to guard chickens against predators from the air such as raptors as well as predators on the ground such as raccoons. For fencing material, we recommend using 1⁄4-inch hardware cloth as opposed to chicken wire because of its superior strength. Bury the hardware cloth at least 5 to 6 inches in the ground and cover with rocks or pebbles. (Rodents don’t like to dig through loose rocks.) Walk the fence daily to inspect for holes.